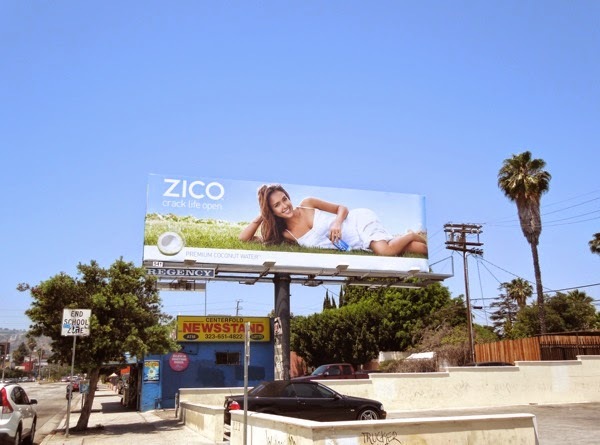 Zico Coconut Water is back in the skies of L.A. with a fresh new image. 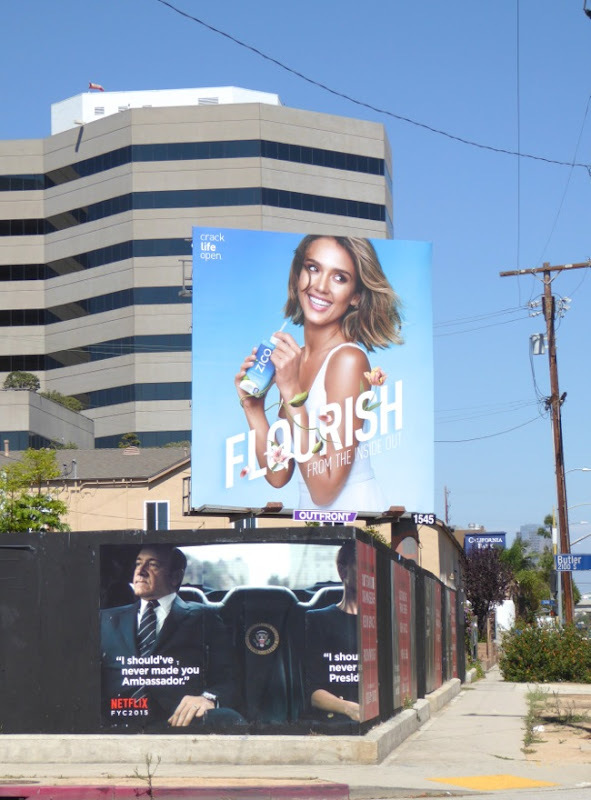 Gone are the quirky ad campaigns, replaced by a new brand ambassador in the form of actress Jessica Alba (soon to be seen on the big screen reprising her role as 'Nancy Callahan' in Sin City 2: A Dame to Kill For). 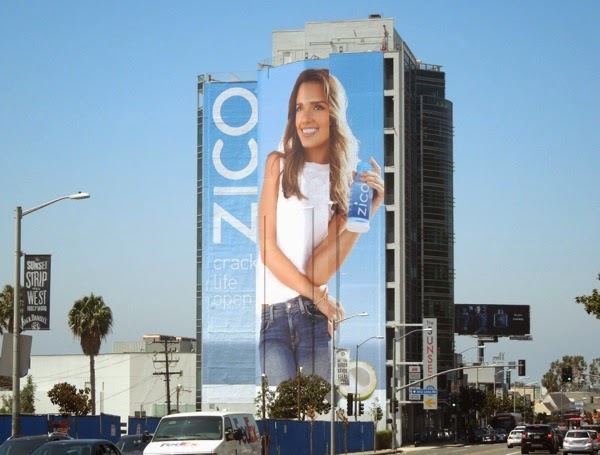 Zico became a wholly-owned brand of Coca-Cola last year, so the new ad campaign follows a similar strategy used by Vita Coco who used Rihanna as the face of their coconut water drinks back in 2011, and the new Zico approach is reminiscent of the Coca-Cola owned Smartwater ad campaign featuring Jennifer Aniston. 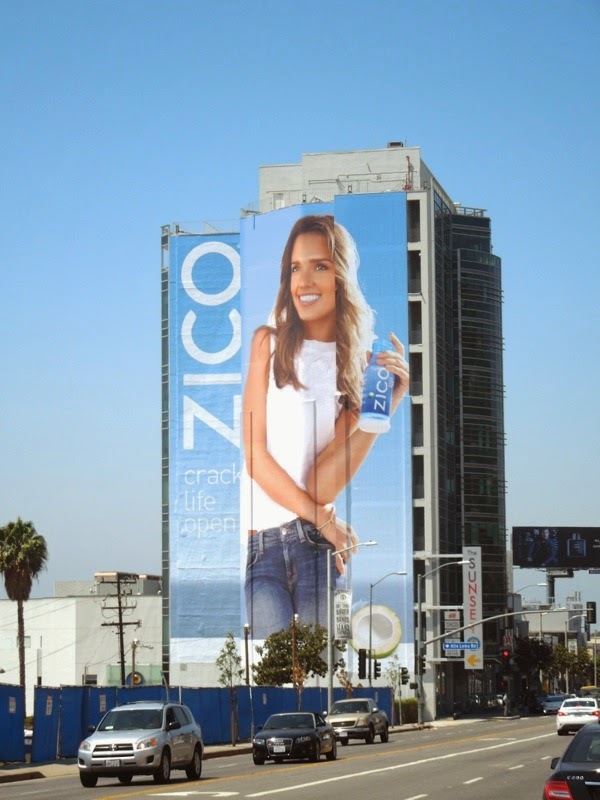 The low calorie, high potassium-laden coconut water is being positioned as a natural alternative to a traditional sports drink and a healthier option than sodas or drinks with added sugars, so it's only natural the brand would choose a slim model for their advertising. 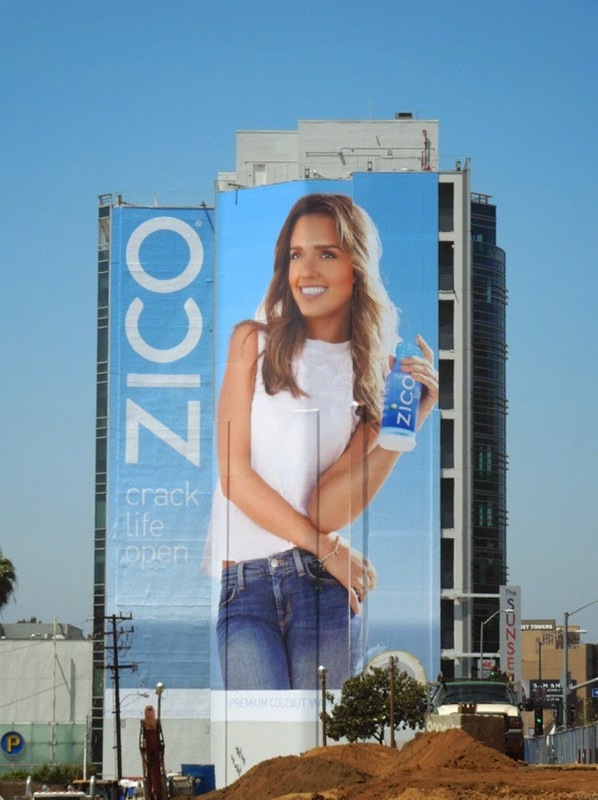 And even though the 'Crack life open' billboards featuring the fresh faced actress stand out, in Daily Billboard's opinion they are not as exciting (or humorous) as the previous Zico Coconut Water outdoor ad campaigns. There's nothing particularly bad about these mainstream ads, but this multi-million dollar celebrity endorsement approach is much more expected and it feels like a slightly more sanitized concept, and everything you'd expect from a massive multinational beverage corporation. 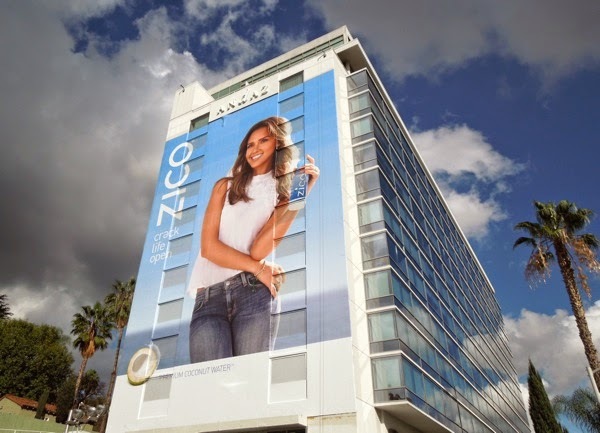 The landscape Zico billboard was spied along Fairfax Avenue on June 9, whilst the giant-sized wallscape creative was photographed along L.A.'s busy Sunset Strip on June 13, 2014. What do you think? 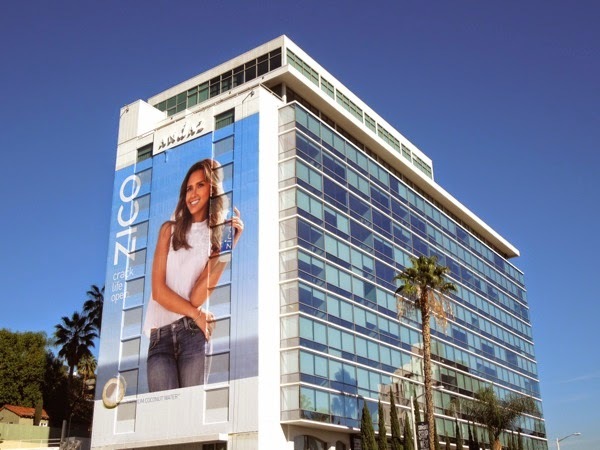 Is Daily Billboard nuts, or is Zico's new OOH billboard campaign not all it's cracked up to be? 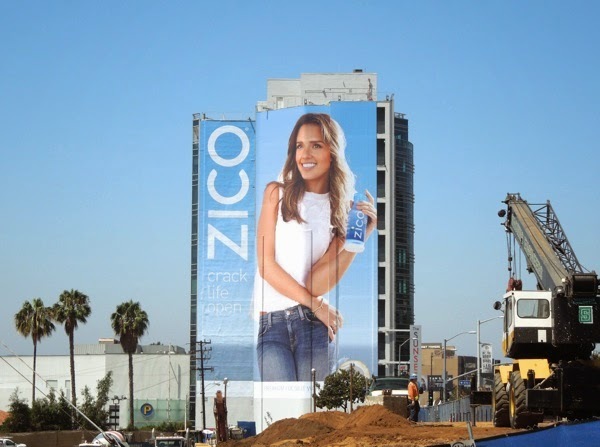 UPDATED: Zico obviously want to get a head start on that healthy New Year, with a second wave of giant billboards for their coconut water drink. 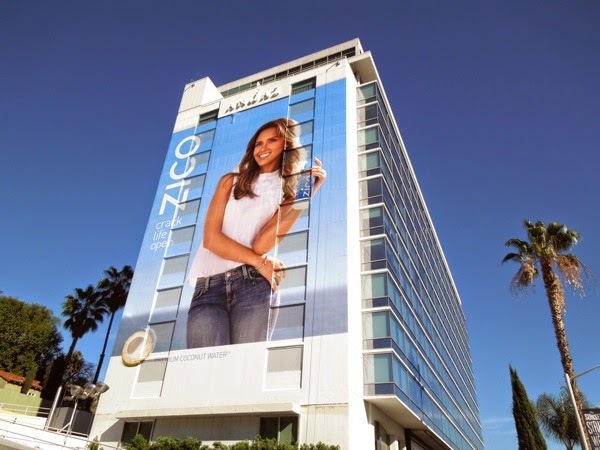 This super-sized billboard featuring Jessica Alba was spied on the side of West Hollywood's Andaz Hotel along the Sunset Strip on a stormy December 4, 2014. 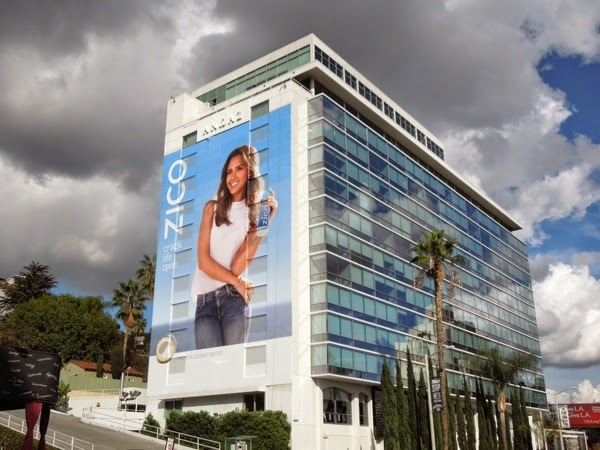 And here is the giant billboard on a much sunnier day that same month. Sunshine makes everything look better and more healthy don't you think. 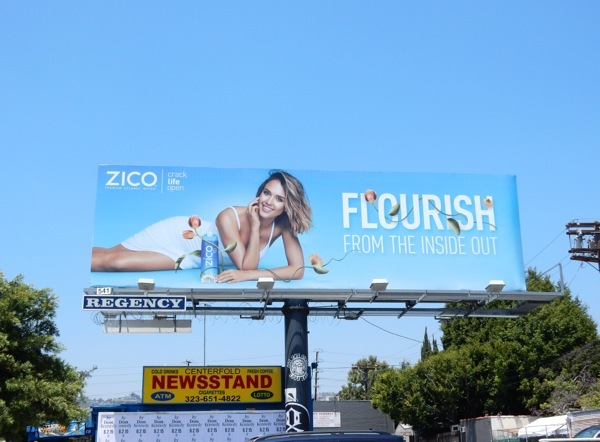 UPDATED: Jessica Alba is back in the skies of L.A. with a new vibrant 'Flourish from the inside out' campaign for Zico. 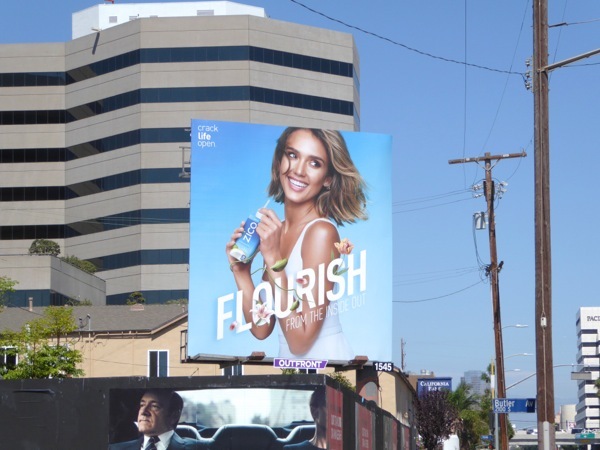 This standard landscape billboard was spied along Fairfax Avenue at Melrose Avenue on May 27, whilst the super-sized creative was snapped along the busy Sunset Strip (currently under major construction) on June 25, 2015. 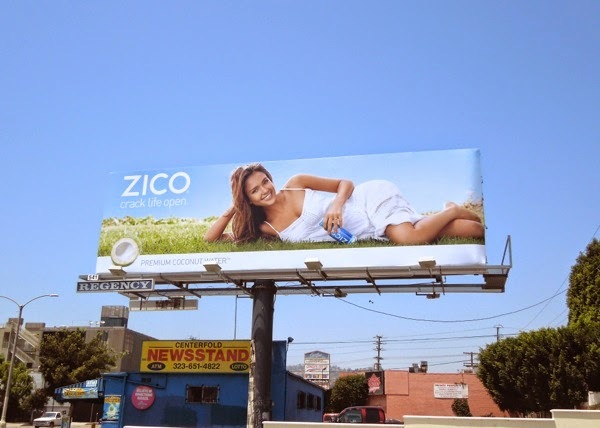 UPDATED: Here's another ad format for the latest Zico outdoor campaign spied along Olympic Boulevard in West L.A. on August 29, 2015.